Mazda3 popularity in the UK is boosted this spring by the availability of 14 ‘Great Buys’ with five outstandingly generous equipment levels, a choice of six powertrains and prices ‘fixed’ until 30 April. Representing great value, Mazda3 prices, which start at just £11,201, have not risen since mid-2008 and a selection of Typical 0%, 4.9% and 5.9% APR finance packages are now available. “Today, as customers focus even more sharply on exactly what car they can get for their money, the Mazda3 line-up presents 14 truly great buys,” commented Mark Cameron, Sales & Marketing Director, Mazda UK. “The introduction of the upgraded Mazda3 range last year saw a host of previous options fitted as standard which made the popular hatchback and saloon even more appealing. While competitor cars are suffering price hikes this spring, Mazda’s core attributes, specifications and ‘fixed’ prices stand out as uniquely attractive. “As well as offering consumers exceptional standard equipment on each Mazda3, we are also maintaining extremely competitive pricing. 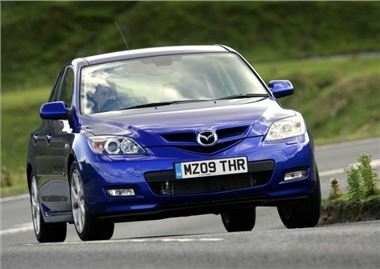 The 2009 Mazda3 range represents outstanding value&#8209;for-money and is sure to prove the right choice – the right car at the right time at the right price – for customers in the hugely competitive family car market,” adds Cameron. Starting price for the Mazda3 range remains £11,201 (Mazda3 1.4 S hatchback) and prices rise to £17,626 for the range-topping Mazda3 2.0 Sport Diesel (143ps) hatchback with standard leather trim and a seven-speaker premium BOSE® audio system. All six engines (three petrol and three diesel) available in the Mazda3 are Euro stage 4 compliant. CO2 emissions range from 157 to 189g/km (petrol) and from 125 to 162g/km (diesel). The two Takara petrol models are available fitted with the optional Activematic four-speed automatic transmission. Mazda3 entry-level models have always been considerably well specified – and the 84ps, 1.4-litre ‘S’ comes with four airbags, remote central locking with deadlocks, electric front windows, electric heated door mirrors, single CD player with four speakers, jack-knife key and a Thatcham Category 1 alarm among their standard equipment. They also feature an MP3 compatible CD player, auxiliary (AUX) input jack for MP3 connectivity and 12V power socket. Prices for the petrol and diesel hatchback models are £11,201 and £12,659 (OTR) respectively. The two ‘S Air con’ models add manual air-conditioning to the standard specification and are priced from £11,690 (OTR). ‘Takara’ in Japanese means ‘treasure’ which appropriately reflects the five available Takara models’ (from £13,310) outstanding specification which includes: a front sports bumper and two-bar sports grille, front fog lights, rear spoiler, 16-inch alloy wheels, climate control air conditioning, integrated steering wheel audio controls, driver’s seat adjustable lumbar support, rear seat centre armrest and full length curtain airbags, illuminated vanity mirrors, piano-black centre console and two-tone black/dark grey interior trim, a leather rimmed steering wheel and gear knob, electric rear windows (with global opening/closing), a trip computer and a 6-CD auto-changer. The availability of the Sport model (from £14,886), with the 105ps 1.6-litre petrol engine and five-speed transmission gives customers the option of a lower CO2 output (162g/km). The two Mazda3 1.6 Sport models have much of the range-topping equipment from the 2.0 Sport – such as the full Sport styling kit, 17-inch alloy wheels, xenon headlights, rain sensing auto-wipers and dusk sensing auto-lights, rear combination lamps with LED lights, blackout instruments and a premium BOSE® audio system with seven speakers. In addition to the features of the 1.6 Sport models, the range-topping Mazda3 2.0 Sport models (from £16,257), are also fitted with leather seats as standard. All three are equipped with a precise six-speed manual transmission and customers can choose between the 2-litre 150ps petrol engine or Mazda’s 2-litre diesel engine which generates 143ps and 360Nm of torque at just 2,000rpm. Powered by this engine, the Mazda3 hatchback accelerates to 62mph in just 9.9 seconds, reaches a top speed of 126mph, returns 47.1mpg (combined cycle) and has a CO2 rating of just 162g/km – delivering an unrivalled combination of performance and economy.